Nasal congestion is a common ailment that impacts toddlers. Although it is not a serious health concern, it can be quite annoying for the toddler and parents. Congestion occurs when the nasal passages become inflamed and swell. The result is a sensation of stuffiness or full sinuses. Over-the-counter decongestants are not recommended for toddlers until they reach the age of six, according to the American Academy of Pediatrics. Instead, try other more natural cures. Over-the-counter pain relievers can minimize the discomfort often associated with nasal congestion. Toddlers can have headaches and pain in the face where the sinuses are located. OTC pain relievers, like acetaminophen or ibuprofen, can also be used to reduce inflammation, which can diminish the swelling of the nasal passage tissues. 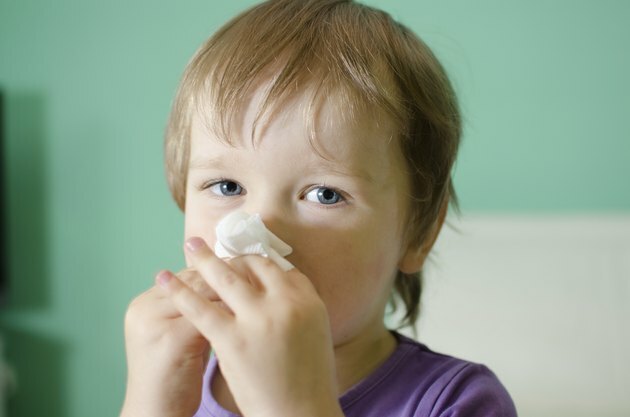 Use saline nasal sprays, especially those made in a small bottle for toddler noses, to soothe the nasal lining. The saline solution can help thin the mucus and encourage it to run out of the nose. You can also mix table salt and tap water and administer it to the nose using a dropper to create the same relief as commercial saline sprays. A neti pot can be beneficial for toddlers who are cooperative. This device distributes saline solution into the sinus passages, where it runs out with mucus. A rubber bulb syringe is an effective tool for suctioning the mucus and saline solution from the nose, states AskDrSears.com. Dry air can be extremely irritating, especially when a toddler is already congested. Running a cool-mist vaporizer or humidifier while a toddler sleeps can make breathing easier, states BabyCenter.com. Placing a toddler in the bathroom while a hot shower runs can provide the same moisturizing effects for the nasal passages. Eating warm soup and drinking plenty of fluids will thin the mucus and promote drainage. Putting a toddler in a warm bath with a few drops of menthol or eucalyptus oil also can offer temporary relief. Keeping a toddler's head elevated can promote the expulsion of the mucus, instead of helping it pool in the sinuses. This is especially helpful when a toddler is sleeping. BabyCenter.com suggests propping the bed with a pillow under the mattress, but not if the toddler moves about throughout the night. The toddler could end up sleeping with his feet above his head, making congestion more uncomfortable.